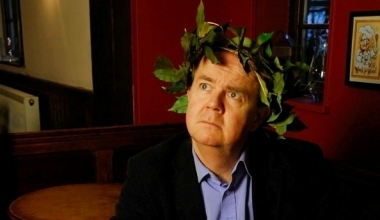 Ian Hislop takes an amused and affecting look at one of the most peculiar offices in the British establishment, that of Poet Laureate. Its 341-year history produces a gloriously eccentric picture of who we are, how we are ruled, what we want to say about ourselves, and just how hard it is to do that in verse. We know that Poets Laureate write about Royal Weddings (usually extremely badly), but Ian discovers a whole lot more. Like 534, John Masefield's brilliant poem on the launch of the Queen Mary from the Clydebank shipyards. Like Nicholas Rowe's New Year's Ode for 1716 which chose as its subject the Princess of Wales' labour pains. And like Alfred Tennyson, who wrote the nation's favourite poem, Charge of the Light Brigade. The film also throws light on the shadowy process by which the appointment is made. Lord Gowrie, the Arts Minister in Mrs Thatcher's Cabinet, reveals how Ted Hughes came to be her choice for Laureate, when many people were still damning him for his wife Sylvia Plath's suicide. Ian gets to the bottom of the bizarre tradition of the payment in sherry (650 bottles of the stuff! ), and after trying a glass or two himself, poetic inspiration strikes and he concludes the film with his very own Ode, to Carol Ann Duffy, our newest Poet Laureate.